4 Bedroom, 2 Bath Cottage - 350 Feet to Sandy Beach! 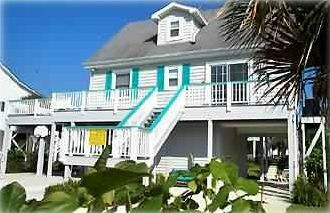 Literally just 350 feet from the Atlantic Beach, this cozy cottage offers four bedrooms with has two bedrooms and one bath on main floor as well as two bedrooms and one bath upstairs. Rock in the rocking Chairs on the screened porch; a perfect spot to enjoy a book and sea breezes. Parking is perfect with covered three-car parking and plenty of additional parking for all of those friends who want to share your vacation! Play a game of basketball on our basketball goal and then go for a swim in the ocean! When you get back, take a shower in our outdoor enclosed shower; nothing like it! We have a complete laundry room on the first leverl for ease when coming from the ocean; throw all the beach towels and bathing suits in when you get back. Our underneath paved area is great for scooters, tricycles, skateboarding, and cookouts. Our location is on a lovely quiet street without all the beach traffic; an ideal location which is only two homes to ocean with easy beach access. Enjoy beachcombing for miles, bike riding, and short ride to all restaurants and shops. This home is perfect for those who want a beach vacation to be easy on the budget. Our weeks run Sunday - Sunday, giving you an entire weekend to enjoy the end of your vacation. Holidays rates will apply, of course. Have owned the Original Sea Cloud for over 40 years and moved it to its current location in 1990. I grew up on Edisto and own a very successful real estate company. Graduated from the College of Charleston and plan to live on Edisto Forever. Enjoy sailing, yachting, jet skiing, tennis, golf..beachcombing, all outside sports. Edisto is a secluded barrier island with a laid back family atmosphere. I grew up on Edisto, own a real estate company here, my husband owns 2 retail stores here, where else would be better to own rental property? Great family home with living room open to dining room. Cozy screen porch to enjoy sea breezes, family time, cocktail hour, or just chillin. Hugh open sundeck with lounge chairs for sunning, spacious table for outside meals, great area below for cookouts, oyster roast, crab boils, shrimp stews. Also has enclosed hot/cold shower to enjoy when coming back from beach, concrete area for kids to bike, skateboard, basketball goal for all around fun! Located 2 homes to ocean with some view of ocean but back on secluded quiet street. It doesn't get any better than this. Sheets for all beds and a towel service for 8 guests. One in family room, one in bunk bed room downstairs and one in guestbedrom 4 upstairs. The house was very dirty as were the linens they provided. I wouldn’t rent from them again. We had an amazing time here --- the location is great, the amenities are nice and house is tastefully decorated. The screened in porch and large side porch are perfect for enjoying a book, breakfast or a nap in the sun. The only reason for the 4-star rating is due to some small maintenance issues as mentioned in earlier reviews, like dusting, non-working light bulbs and a stopped up bathroom sink. Otherwise, perfect beach getaway! Enjoyed our stay. Short walk to the beach. We stayed in February so the island was very quiet and many places where closed for the winter. Our first experience on Edisto was peaceful, calm, serene...and our house was the same. We had an enjoyable two weeks - house was excellent location, supplied with everything to make our stay comfortable (e.g., kitchen supplies!). Edisto is pet friendly, the local food was OUTSTANDING - and although we were not prepared for the constant Atlantic winds - took the "advertised temperatures" form 60's into what seemed like the 40's at times - the beachwalks were refreshing, the neighborhood strolls relaxing. What would have made the stay better was some attention and TLC to the property. We bought refrigerator bulbs, smoke detector batteries, dealt with a broken washing machine (fixed pronto!) as well as a clogged main floor bathroom sink. So with some routine checks/maintenance and some TLC this would be a 5-star. Perfect house for us. Very accommodating for our family. Loved the outdoor seating areas. Will stay here again. Only thing I would change is adding an ice maker. TO TAKE ADVANTAGE OF THE WEEKLY RATES YOUR RESERVATION MUST BE SUNDAY - SUNDAY. IF THAT WILL NOT WORK FOR YOU THEN WE WILL ACCOMMODATE YOU AT THE NIGHTLY RATE IF WE POSSIBLY CAN. Rates are subject to change at any time without prior notice. HOLIDAYS ARE EXTRA AND THE AUTOMATIC PAYMENT QUOTE DOES NOT HAVE THAT OPTION. Reservations are NOT confirmed until your Reservation Amount and Signed Reservation Agreement is received. Dogs only please and the pet fee is per dog. Our refund policy is if we are able to re-rent out your time reserved you will receive a refund minus a 10% fee and possible credit card fees.